Apart from his first year as a baby and the past two weeks, Faure Gnassingbe has been a president’s son his whole life. His father, General Gnassingbe Eyadema, ruled Togo with an iron hand for almost four decades, putting people from his northern Kabiye tribe in key government and military posts. Eyadema’s sudden death on 5 February left Gnassingbe as the best bet the extended family business had of clinging on to the perks of power, diplomats and analysts say. Within hours of Eyadema’s death, the army swiftly catapulted the burly 39-year-old business graduate into his father’s shoes, taking advantage of the fact that the dead president’s rightful successor was out of the country. The next day a parliament stacked with family allies amended the constitution and the electoral code to retroactively rubberstamp the transition of power and clear Gnassingbe to rule until 2008. “These guys have not been accountable for 38 years, and they want someone who can protect their interests,” one Western diplomat in Lome told IRIN. Despite a tide of international condemnation, the threat of sanctions from neighbouring West African states and protests on the streets of the capital, Lome, crushed by police firing live bullets into the crowd, Gnassingbe has refused to stand down. In a television address to the nation on Friday night, he announced that he would hold fresh presidential elections within 60 days in line with the old constitution. However, to the anger of opposition leaders, Gnassingbe declared he would stay in power until then. Even Gnassingbe’s aides play up his tendency to keep a low profile. “Calm, placid and discreet,” is the first description of the new leader in a one-page biography handed out by his office. Until the end of this week, Gnassingbe had largely managed to avoid the diplomatic limelight as international condemnation bored down on him. 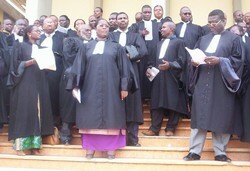 [Togo] Togolese lawyers take to the steps of the capital's law courts to protest the seizure of power by Faure Gnassingbe. February 2005. He sent his close political allies, including the foreign minister Kokou Tozoun and influential military figures, like retired general Seye Memene, to a flurry of meetings in Niger, Burkina Faso and back home in Togo. When it became clear that Economic Community of West African States (ECOWAS) was standing firm with its threat to impose sanctions on Togo unless the country returned to its old constitution, Gnassingbe ventured out on his first foreign trip to Nigeria. He met President Olusegun Obasanjo, the current head of the African Union who has been one of his most vocal critics, in the Nigerian capital Abuja. Obasanjo, a former military head of state who spent decades in the political wilderness before returning to power as an elected president, cast himself firmly in the role of the father figure. Obasanjo reprimanded his errant and inexperienced Togolese junior and accorded him none of the usual honours reserved for visiting heads of state. Gnassingbe flew home without making a public comment. Twenty fours later, dressed in a dark suit, his eyes flitting repeatedly off camera, he went on television to promise Togo’s five million people elections in early April, but said he would stay in charge until then. “It’s a very careful search for space,” said Olly Owen, Africa analyst for the London-based Global Insight. 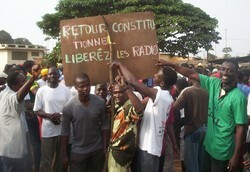 In Togo, a narrow strip of land sandwiched between Ghana and Benin, former state employees talk about how they were passed over for promotion because they were not fervent supporters of the ruling Rally of the Togolese People (RPT) party, which controls all but a handful of seats in parliament. Businessmen bemoan the fact that their enterprises have run up against obstacles because of their political persuasions. Many people point to the military’s stranglehold on the country. “The military are everywhere. They control the financial institutions -- the port, the tax office and the customs,” explained Jean-Pierre Fabre, the secretary-general of the main opposition party, the Union of Forces for Change (UFC). The military hierarchy is dominated by the Kabiye, the dead president’s ethnic group which makes up just 13 percent of the population and this is a bone of contention with Togo’s largest tribe, the Ewe from the south. But it is not the entire army that is reaping the benefits. “The people with the keys to the army arsenal are those protecting the president. A rebellion in the army is not possible because those that favour democracy are not those with the weapons and the ammunition,” said Adote Akwei, head of the Togolese Human Rights League. Togo’s political opposition and many people on the streets cast Gnassingbe as a puppet, propped up as head of state by his Kabiye ethnic kinsmen who hail from the north. But some diplomats and analysts disagree, saying it is natural for any president -- from the leader of the world’s only superpower George W. Bush on down -- to have a team of advisors who shape strategy. “He’s no puppet, he’s simply the visible part of the iceberg, the acceptable face of the family,” said Owen of Global Insight. Faure, 39, was born in Afagnan, in the southeast corner of Togo, about 30 km from the border with Benin. His school days were split between the main northern town Kara and the southern capital Lome, before he jetted off to former colonial power France to study management and cement contacts. A stint in the United States followed, during which he obtained an MBA at George Washington University. Then it was back home to Togo to carve out his political career. He was elected a deputy in the national assembly in 2002 and by mid-2003, he was Minister for Public Works, Mines, Post and Telecommunications. That put him in charge of Togo’s lucrative phosphate mines, the country’s main source of foreign exchange earnings, and early-stage oil exploration. Faure is not the only prominent son of Eyadema embedded in Togo’s ruling elite. His brother Kpatcha heads the state body SAZOF, which oversees investments into and exports out of the country. Another sibling, Ernest, was in charge of the army’s parachute regiment until he fell ill. Then there is Rock, the brother who is president of the Togolese Football Federation. However, Faure was the only one of Eyadema’s estimated 100 children from several wives, to assume a high profile in government. Some Togo watchers say a constitutional change in 2002, showed he was clearly being groomed as the presidential heir apparent. 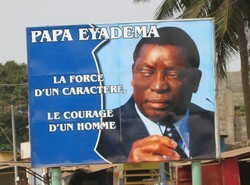 [Togo] Billboard in Togolese capital, Lome showing the man who ruled over this West African nation for 38 years, Gnassingbe Eyadema. February 2005. Eyadema, who seized power in a military coup when he was 31, reduced the minimum age for the president to 35. This made Faure immediately eligible to take over the reins of power if something happened to Dad. Meeting Faure, people are struck by his youth, but that fresh face look also scares many in Togo. “He’s young and that means we could have another 40 years of this familial dictatorship, this Togolese mafia,” said one 26-year-old unemployed phone technician, who would only give his name as Frederic. Some have compared Gnassingbe to ‘Baby Doc’, Jean-Claude Duvalier, who tried to succeed his father ‘Papa Doc’ Francois Duvalier, as president of Haiti, with disastrous consequences. However, there are other observers, both national and international, who lament not the man but simply the way he was propelled to power by military hardliners.